Capsicums are used widely in Mediterranean dishes and growing capsicums is not difficult. Capsicums can be grown from seed or seedlings. 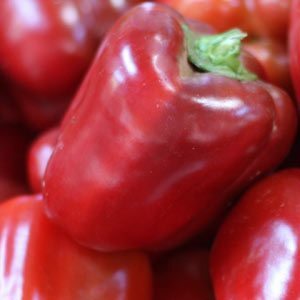 Also known as bell peppers, sweet peppers capsicums come in a range of colors from yellow and green through to red (picture right0 and deep purple. The time to grow capsicums is during the summer months. The plants will reach 40 – 50 cm in height and the fruit is best left to ripen on the plant for maximum taste. You can buy seedlings from good retail nurseries in spring, seeds are available for sale online with a wide variety including new dark colored capsicums. Seeds can be planted into trays for around 6 weeks before planting out. Use a cold frame or greenhouse in cooler climates, or start them indoors in a sunny position. Plant from August (seeds) to November and keep moist. In warmer climates plant seeds directly from November to Feb. Growing Capsicums (Bell Peppers) in containers. You can grow capsicums in containers or in the ground, however they can’t be planted outdoors until the danger of frost is over and the weather is warming up in spring. Seeds can be started indoors 6 weeks before they are to be planted out. A single large variety pepper plant requires a pot of around 40 cms wide. With smaller types 3 plants will fit into a 40 cm container. Plants should be staked, a bamboo stake is ideal, it is also a good idea to mulch around the plant. You will need to water the plant in well and for low care consider installing a drip irrigation system. We like to use a liquid seaweed fertiliser to water in the plant, and repeat this watering every 3 – 4 weeks. Alternate with a fish fertiliser if you wish. Fish fertilisers and seaweed fertilisers contain a wide range of nutrients that work well on a range of plants. You can also use a tomato fertiliser. An additional watering with an epson salts solution is also beneficial. Most pests can be controlled using a Neem oil spray. Capsicums prefer a well drained humus rich soil with lots of organic matter. We suggest digging all vegetable beds to at least 40cm. Well composted manure can be dug in, mulch around many vegetables to prevent weeds. A sunny position is best and sow when the risk of frosts has passed. We use a liquid seaweed fertilizer combined with liquid ‘worm casting tea’ for good results in our soil. In temperate areas of Australia capsicums can be planted into the garden from October to December. seeds can be sown indoors or in a greenhouse as early as August, they will geminate quickly and can be planted out after around 6 weeks. Planting early can cause problems as cold soil and cold night temperatures will inhibit growth. If you need to plant early try setting up a small plastic igloo for protection. Plants will take around 3 months to harvest time. What is the difference between red, green and yellow capsicums ? Capsicums will change color as they ripen, green to red and yellow, some heirloom varieties will produce brown or chocolate colored fruit. A green capsicum will not turn red after it is picked, it needs to ripen on the plant. And yes you can grow capsicums in pots, use a quality potting mix, a sunny position and keep moist. Are they perennials or annuals? They are usually grown as annuals, however, in warmer climates they can be perennials. So you can try cutting them back and seeing what happens if you live in Brisbane or further north. We have never tried this, to far south.